Bali News: International Airport, I Gusti Ngurah Rai, Bali, was closed for 24 hours while Nyepi, New Year of Çaka 1937, on March 21, 2015. Balinese New Year based of Balinese Calendar. Closure of Ngurah Rai Airport during Nyepi Day is routine, conducted since 2000, and regularly performed every year until now. based on the Balinese calendar, and covered a total of over 24 hours. During the 24-hour airport does not operate to honor citizens of the Balinese, who celebrates of Nyepi to stop all activities. See also: About Nyepi 2015 in Bali. The closure of the airport runs from 06.00 am (UTC + 08) on March 21, 2015, until the next day at 06.00 am, March 22, 2015. Although total ditutp airport for 24 hours during Nyepi Day, but for certain conditions, such as emergency landings and medical reasons, it is possible to open the airport operations. Just as the use of an ambulance for medical purposes, ambulances are allowed passing on the highway as Nyepi Day. Because the Ngurah Rai Airport is an alternative airport, for certain conditions such as emergency, Bali's Ngurah Rai airport remain alert to operational officers who have been provided, security officers, ground handling personnel and other relevant agencies. Parties to the airport has sent "Notice to Airman" (Notam) with number A0068 / 16 on January 16, 2015 to all airlines and airports around the world so that the airline can adjust or reschedule flights. 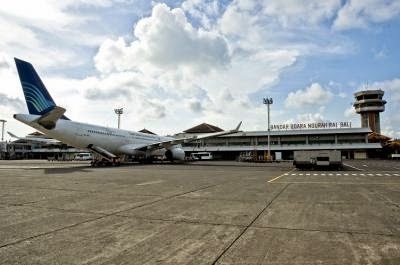 Ngurah Rai Airport also has coordinated with a number of agencies including enterprise, security officers, up to village officials around the airport. During Nyepi, as many as 258 domestic regular flights from 10 national airlines and 164 international flight schedules are served 23 airlines serving routes to the rest of the city in the world does not operate. The last flight just before the closing will be served by the airline Korean Air destination Incheon, South Korea, which took off at 3:00 am, on March 21, 2015. Closure of airports in total has been ongoing since 2000. The Ngurah Rai International Airport is one of the busiest in the country with an average movement of both domestic and international passengers as much as 47 370 people per day or 1974 people per hour. Read also: Ogoh-ogoh parade 2015 will take place on March 20th | Nyepi Day 2015.